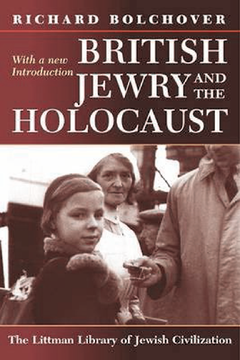 How did British Jewry respond to the Holocaust, how prominent was it on the communal agenda, and what does this response tell us about the values, politics, and fears of the Anglo-Jewish community? This book studies the priorities of that community, and thereby seeks to analyse the attitudes and philosophies which informed actions. It paints a picture of Anglo-Jewish life and its reactions to a wide range of matters in the non-Jewish world. Richard Bolchover charts the transmission of the news of the European catastrophe and discusses the various theories regarding reactions to these exceptional circumstances. He investigates the structures and political philosophies of Anglo-Jewry during the war years and covers the reactions of Jewish political and religious leaders as well as prominent Jews acting outside the community’s institutional framework. Various co-ordinated responses, political and philanthropic, are studied, as are the issues which dominated the community at that time, namely internal conflict and the fear of increased domestic antisemitism: these preoccupations inevitably affected responses to events in Europe. The latter half of the book looks at the ramifications of the community’s socio-political philosophies including, most radically, Zionism, and their influence on communal reactions. This acclaimed study raises major questions about the structures and priorities of the British Jewish community. For this paperback, the author has added a new Introduction summarizing research in the field since the book’s first appearance. Richard Bolchover studied at University College London and at St Antony’s College, Oxford, and was a Rotary International Foundation Fellow at the Hebrew University of Jerusalem. He was a founder & director of Close Fund Management Ltd and is now a Partner at Nimrod Capital LLP.